Fabien Cousteau, grandson of famous oceanographer Jacques Cousteau, has completed a 31-day stay in an underwater laboratory, thus breaking his grandfather's "underwater living" record, writes Nature World News. The team spent the month in Aquarius, which is a 43-feet-long underwater laboratory near a coral reef, off Key Largo, Fla. (See EN, June 2014). Fabien, along with two "aquanauts," dived 60 feet on June 1, 2014, to reach their underwater home. According to Reuters, Aquarius is air-conditioned and also has full Internet service, and is operated by Florida International University. Fabien and his team named their expedition, Mission 31. "This expedition's main goal was to reach as many people around the world ... to impassion future generations to care about the oceans, to cherish them, to be curious about them in a way that existed during my grandfather's era," Cousteau told a news conference after surfacing. The team studied climate change, effects of ocean acidification, pollution, and predator-prey relations, among other issues. "We'd contacted tribal chiefs months ago seeking access permission and finally received a phone message indicating tacit approval. But we didn't know what to expect as we approached their villages by canoe," said Freeman. "However, they treated us like family. The kids and elders alike were keen to show us their community and share native gifts and meals with us." It wasn't until 40 years ago that Brazilian officials made their first contact with the Cinta Larga. As Freeman and Schurke found, the tribe's transition from the Stone Age to the Space Age was stunningly abrupt. "They still maintain their traditional hunting and fishing practices but the chiefs now connect with the rest of the world through Facebook," said Schurke. "Just as we neared the first village, we heard a roar of elation erupt. It turns out they were all gathered in the village square watching the community's only TV as Brazil scored a goal in World Cup soccer." "Brazil is a country of such amazing contrasts," said Freeman. "Its coastal cities are burgeoning industrial centers with cutting-edge, global high-tech businesses. But most of the country is comprised of the Amazon, a forest over half the size of the U.S. which is home to ten of thousands of people who live just as their ancestors did." All told, the two paddled about 400 miles of the Rio Roosevelt during their month-long trek, including about two dozen miles of rapids that they ran, lined or portaged with their folding Pak Boat canoe. Ninety years after he disappeared on Mount Everest, climber George Leigh Mallory was honored at The Explorers Club by Conrad Anker and Wade Davis. The historic Clark Room was over capacity on June 12 when members and guests turned out for this dream team of exploration superstars, plus an art exhibit of original work by Thom Ross and Anker's wife, Jennifer Lowe. Both Anker and Davis recounted the history and vision of this unique and incredible man, the discovery of his body by Anker in 1999, and the mystery that endures about whether he was the first man to summit Everest. Davis, hailed by dinner chairman Daryl Hawk as a scientist, scholar, poet and passionate defender of life's diversity, is author of Into the Silence: The Great War, Mallory, and the Conquest of Everest (Knopf, 2011). He believes the conquest of Everest in the early 1920s "became a mission of imperial redemption." At that time, "trying to reach Everest was like trying to go to the moon." Locating Mallory's body was the "greatest discovery in the history of mountaineering." Davis shared the little-known fact that the world has been mispronouncing the mountain's name for decades. "It's supposed to be 'Eve-rest,' not 'Ev-rest,'" he told the crowd of 100. Anker remembers wistfully back to the heroic era of mountaineering, "The days of tweed jackets when climbers read Shakespeare to each other." On finding Mallory's body, Anker said, "It was a very humbling moment. I was awestruck. I couldn't make sense of it. For a split second I thought of not telling anyone." Knowing that his radio was being monitored, he used a code phrase to announce the discovery: "mandatory group meeting." Anker, who believes Mallory and climbing partner Sandy Irvine turned back at the base of the First Step, professes the greatest respect for Mallory, "He chose the safest, most logical route up the mountain - the North Col."
Concludes Davis, "It doesn't matter if Mallory and Irvine got to the top. It's remarkable they got as high as they did. ... these were the kind of men we'll never know again." For two weeks in May, explorer and filmmaker Jon Bowermaster's One Ocean Media Foundation helped organize - and filmed - a learn-to-swim program on the remote Maldivian island of Eydafushi. Despite living just a couple feet above sea level, many of the locals there never learned to swim. With the support of the Slow Life Foundation and Soneva Fushi Resort, Bowermaster's goal was to get moms and kids more confident in the water, in part as a way to impress upon them the importance of taking better care of the ocean that surrounds them. At the end of the two weeks, the 48 third graders and 18 mothers who had come for lessons each day put on masks, fins and snorkels and finally had a close-up look at the world below the surface. "Like many corners of our ocean world the Maldives suffer from a variety of ills, mostly manmade: Overfishing. Plastic pollution. Rising sea levels due to a warming ocean. And acidification," Bowermaster writes. "Teaching these incredible families to swim was a first step towards encouraging them to become even better guardians." Swim lessons will continue; the film will be finished in fall 2014. Last month, Italian explorer Francesco Sauro, 29, won a 41,000 Euro ($55,780) grant from the Swiss luxury watchmaker, Rolex, to explore caves in South America. The Rolex award will allow him to continue his work on the caves in the Amazonas region of Brazil and Venezuela, according to The Local, Italy's English language news website. "The mountains are completely different from every other environment in the world; the rock is about 1.6 billion years old. The mountains rose up after the opening of the Atlantic Ocean, he tells reporter Rosie Scammell. "These are probably the oldest caves in the world," he says. Getting to grips with such an environment may be a challenge for the average person, but there is one group that can relate to Sauro: astronauts. In the caves there is "no day and no night," Sauro says, matter-of-factly, of the eternal darkness he endures. "This is what happens if you go to space; the time is not controlled by night-time and daytime." Sauro continues, "Caves are three-dimensional features inside the mountains. You have to move in a three-dimensional way, on different gallery levels and at different depths. It's much more complicated that at the surface," he explains. As an expedition leader, Sauro also helps astronauts with safety training, preparing them for work outside the International Space Station. "They have to be rigged to the station otherwise they will fly away." Stanford alumnus Caleb Kruse '14, his brother Cameron Kruse and their friend Jordan Fatke received one of National Geographic's Young Explorers Grants to give away ice cream across America in order to inspire "the next generation of explorers and conservationists." If that's the case, we can't wait for them to visit Connecticut, EN's headquarters state. During their Ice Cream Expedition, the team plans to visit 33 states over a two-month trip stopping along the way to teach kids about conservation while using ice cream as a conversation starter. According to Caleb Kruse, one of the project's founders, the team wants to encourage the children it meets to explore and preserve the natural world around them - anything from a national park to the garden in their backyards. Children will then be asked to sign a pledge to observe, explore and protect their chosen regions. One sponsor is Magnolia Ice Cream, which is providing four unique flavors of ice cream: mango, avocado, guava and a mix of purple yam and coconut. Pack maker Mountainsmith is sponsoring the Blackwater Drifters' kayak expedition of the longest navigable waterway in North America. The two-man team will traverse 14 states and almost 4,000 miles along the Jefferson-Missouri-Mississippi River System. Starting the journey in Brower Springs, Mont., during the first week of June, and paddling approximately eight hours per day, the team is expected to reach the Gulf of Mexico in about five months. The Blackwater Drifters team consists of filmmaker Nick Caiazza and community activist Joe Zimmermann. The two kayakers aim to raise awareness about the many threats to the country's longest waterway as they document their trip. In addition to the long stretches of slow-flowing river water, Caiazza and Zimmermann will paddle across 16 reservoirs spanning over 1,200 miles in length and will need to portage (without any help from gas-powered vehicles) around 16 dams. Mountainsmith will provide the explorers with Andy Mann signature Parallax camera carrying backpacks, new 2015 Mountain Dome 2 tents and 20-degree Arapaho sleeping bags. Their candid blog is a delight to read. They write in part, "We've learned firsthand what a banner year for mosquitoes in Montana looks like. You can either sweat with three layers on or you can put on insect repellent - either way you're cursing the pests." While en route, Caiazza will capture video for an upcoming documentary and create product spotlight films showing how sponsor support is contributing to their journey and their cause. Timex Seeking Adventurers to "Take a Licking"
In order to woo adventurers to its line of Expedition watches, Timex is running a large-scale effort on social media. Working with Vine and Instagram influencers who are posting their own content, the company is also inviting users to post #MyExpedition photos to Instagram, and in return, earn a 25% discount on their purchase, according to a story by Sarah Mahoney on MediaPost.com (July 8). "We can't do the outdoors any better than the North Faces, LLBeans or REIs of the world, but we are trying to give a little spark to the sense of adventure our customers have," Sam Martin, brand manager, tells Marketing Daily. The target market, he says, is more likely to be aspiring to adventure than actually entering canoe marathons or attempting Mt. Rainier. "These are not the people climbing mountains and hanging off a ledge by one finger. That's just not authentic to our brand. But that doesn't mean they don't see themselves as adventurers, and want more expeditions in their lives." Nikwax athlete and accomplished paddler Sonya Baumstein currently is training to be the first person to complete a 5,700-nautical mile solo row from Choshi, Japan to San Francisco in 2015. Baumstein, 28, has an extensive adventure resume. Most recently in 2013, she became the first person to SUP the Bering Strait from Big Diomede to the Alaskan mainland, just north of Wales, Alaska. The prior year, in 2012, she sea kayaked from Seattle to Juneau; and in 2011, Baumstein successfully rowed across the Atlantic, from the Canary Islands to Barbados. During her solo row from Japan to California, Baumstein will collect information that will be analyzed by NASA to increase knowledge of how global warming is impacting the oceans. Baumstein's boat will be outfitted with a device that measures ocean salinity, temperature and depth. To help Baumstein achieve her goal, Nikwax will outfit Baumstein's boat with the Spectra Rowboat 150 water maker. Nikwax also will supply Baumstein with products - including Tech Wash, TX.Direct, Polar Proof and BaseWash Travel Gel - to help clean and maintain the water repellency of her gear to assure she stays dry and warm during her journey. Baumstein is an accomplished ocean rower, paddler and backcountry adventurer. "I get at least one request for free gear sponsorship per week, 52 weeks per year. I hear a lot from college students wanting to spend the summer outdoors. Instead of actually getting a job and working to earn money so they can buy gear and then use it on their days off, they send atrocious letters asking for free gear, offering to be testers and willing to spread the good will of our brand name on their soon-to-be launched "Mysummersadventure" Facebook page. "They need to tell me, the owner of the company purse strings, what their summer adventure will do in real terms to sell more of my company's product, to reach more consumers with our brand name and message and to ultimately drive sales and profits. "I am not sure what college teaches in 2014, but this is a basic business thing. Sell more, earn more profit (and reduce expenses). Not increase vacation spending. "Also, I am not sure why climbers/hikers/skiers, etc., think I should help underwrite their summer fun while I am sitting behind my desk busting my chops to earn a living so they can go outside and play. NO - I've been doing this for close to 40 years - working this outdoor business thing. It's time I was able to get outside once in a while and have all these young bucks work 55 to 60 hour weeks - and be grateful for their two days of skiing per year, six days of hiking and a few bike rides after work. California-based production company Lucky Treehouse got one of the world's best free climbers, Alex Honnold, to climb San Francisco's Goodby, Silverstein, & Partners building and The Palace of Fine Arts for Stride Health. Honnold picked out his first health plan and then headed to San Francisco for a day of urban free climbing. While a veteran rock climber, urban climbing is relatively new territory for Honnold, and he expresses his enthusiasm for the change in scenery. Lucky Treehouse captured the day's events in a documentary video, running approximately five minutes. They also created a 30-second teaser spot for Stride Health. The website doesn't pull any punches: "Okay, so maybe Alex is king of his free-soloing domain, but only once he carefully studies a route. Occasionally he'll slip while roped in and 'take a 40-footer.' If Alex hits his head or breaks a bone, he's only going to have to pay 10% of the doctor bill." The 1st International Explorers Film Festival, presented by the Explorers Museum in partnership with theWorld Explorers Bureau, is dedicated to showcasing the work of adventurefilmmakers of all experience levels from around the world. The EFF 2014 judging panel will shortlistthe very best of these entries for various awards. All shortlisted films will be screened at the Explorers Museum at Charleville Castle Global Expedition Headquarters in Tullamore, Ireland. There is no fee for entries; the deadline is July 18, 2014. Oct. 25, 2014, is a special all-day Space Stories event focusing on the history of human spaceflight at The Explorers Club headquarters in New York. This year's venue will feature astronauts and space-flight participants from several missions using the Cold War as a backdrop - Apollo, Soyuz, Shuttle and SpaceShipOne. The day will include a mix of straight-up talks, "Exploring Legends" interviews by Club member Jim Clash, and panel discussions. Among confirmed story-tellers so far are Charles Duke, Apollo 16 moonwalker; Richard Garriott and Greg Olsen, both of whom flew aboard Soyuz to ISS; four-time Shuttle/Soyuz veteran Leroy Chiao; Walter Cunningham, Apollo 7 Lunar Module pilot; Cady Coleman, who performed a live flute duet with Ian Anderson aboard ISS (and who will play at Space Stories); and Brian Binnie, who piloted SpaceShipOne to win the Ansari X Prize in 2004. Paul Buijs, available to provide onsite communications for outgoing expeditions. He is a technology professional with experience in providing onsite solutions. He is interested in providing real time or near real time expedition photography, web development and social media coverage. Buijs is the founder and editor of Mud and Adventure (MudAndAdventure.com) - a site focused on adventure sports. He is also an internationally ranked obstacle racer and passionate photographer. Get Sponsored! - Hundreds of explorers and adventurers raise money each month to travel on world class expeditions to Mt. Everest, Nepal, Antarctica and elsewhere. 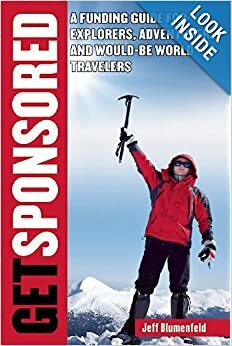 Now the techniques they use to pay for their journeys are available to anyone who has a dream adventure project in mind, according to the new book from Skyhorse Publishing called: "Get Sponsored: A Funding Guide for Explorers, Adventurers and Would Be World Travelers." EXPEDITION NEWS is published by Blumenfeld and Associates, Inc., 1281 East Main Street – Stamford, CT 06902 USA. Tel. (+1) 203-655-1600 editor@expeditionnews.com Twitter: @expeditionnews Editor/publisher: Jeff Blumenfeld. Assistant editor: Jamie Gribbon. Research editor: Lee Kovel. ©2013 Blumenfeld and Associates, Inc. All rights reserved. ISSN: 1526-8977. Subscriptions: US$36/yr. available by e-mail only. Credit card payments accepted through paypal.com. Read EXPEDITION NEWS at ExpeditionNews.com. Enjoy the EN blog at ExpeditionNews.blogspot.com.